The 12 gauge was invented back in the 1870's, but this firearm has by no means diminished in use. In fact, it is one of the most widely used firearms in USA. With its simple to use design and massive firepower at close range, the 12 gauge is used by civilians, military, and law enforcement professionals alike. Federal has been in business since 1922, and continues to deliver premium products that shooters use and trust. 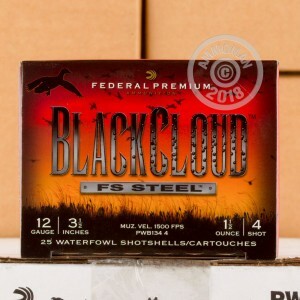 Their Black Cloud line of ammunition is designed to be a top-of-the-line option for waterfowl hunter. Each hull in this box of 25 measures 3-1/2" and carries a 1-1/2 ounce payload of #4 steel shot. 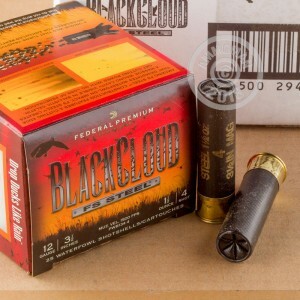 With a muzzle velocity of 1,500 feet per second, these BlackCloud shells can reach out and touch those high fliers. Stock up for the season and save. At AmmoMan.com all orders over $99 will receive Free Shipping!